On the 6th day. – Dirty wet dog , boats and sailing. I turned the electrics on ! Nothing actually happened at first which although mildly disappointing was a far better result than an almighty ‘fzzzzzarkkk’ and then nothing !. With a little bit of checking and wiggling of loose terminals everything that i had done did then start to work so set-to and did some soldering, general tightenning up of connections and tidying of the cable runs and then fitted the back cover for the switch panel. Its incredibly difficult to get decent photographs in that space but thats the back of the switch panel (obviously) just before putting the cover on, doesn’t seem quite as neat as my previous effort but i had a lot more space that time. Its a hell of a lot better looking that the original. The opposite side still looks a bit amateur as the sticky pads that i used are predictably coming off and i ran out of P clips. The battery/charge regulator is showing full which is neat too. 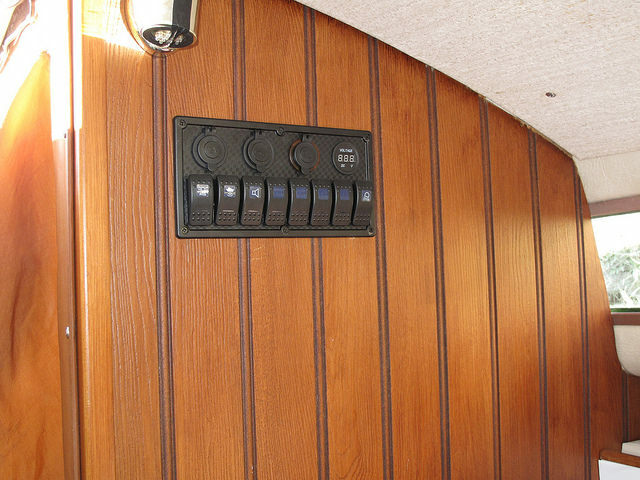 There is space still for another 3 circuits which is ideal : one will definitely go to a tillerpilot, really useful is that the switch panel has a 12v socket which fits my anchor light/roving light. Next job is that i am making a companionway ‘half-board’ which will have a compass mounted and a long lead for its night light, that can be stowed in the heads compartment and be dropped in for heavier sailing and night sailing…there will be at least 2 steering compasses as my main one will now be a bowl type which i much prefer. After that its getting the big battery on board and connected up. A very good suggestion from the battery store is to fit a smart charger at this stage and then plug-in whenever i am in port. On the 7th day the owner had a coffee break : electrics ….work of the devil.